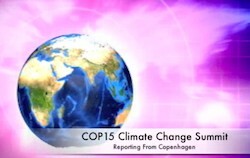 Nelson Muffah speaks to journalists after a daily press briefing from Climate Action Network International on the progress of climate negotiations at COP15 in Copenhagen. Muffah is the Senior Climate Change Advocacy Advisor for Christian Aid. Even though there is talk that “legally binding” is back on the table, Muffah makes clear that the current state of negotiations would likely represent a four degree Celsius rise in emissions by the end of this century – double the two degree rise considered “safe” to avoid the worst consequences of climate change. The situation here is fluid. Minsters begin arriving tomorrow followed by heads of state on Wednesday. With at least 114 world leaders coming to Copenhagen, there is intense pressure for substantial progress, what remains to be seen if it will be enough. Thank you very much Thomas for your honest coverage of all that’s happening in Copenhagen. I appreciate reading your reports of the daily activities. Also, I try to imagine how interesting, powerful and hopeful it must feel to be right in the center of the action. How fantastic! My sincere thanks too for following your passion which is only for the good of all. I am grateful for all of the personal sacrifices you made to be part of Copenhagen. Thank you Ronda – I truly appreciate the support.